As part of a blogging workshop I have been preparing this week, I thought it would be useful to start a collection of blogging and social media tools on Delicious. The idea is provide a continually updated repository of links that journalists in particular can use to help them make the most of the web. Obviously there are loads that are missing at this stage, but if you have any suggestions please post a link for BloggingTools. 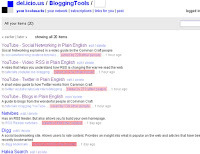 You can find BloggingTools on delicious here.